Ten Speed Press, 9781607745419, 224pp. The vivid colors of fresh produce inspire this artistic collection of whole foods recipes from the creator of the acclaimed blog The Year in Food. Kimberly Hasselbrink, photographer and creator of the acclaimed blog The Year in Food, invites you to look at ingredients differently and let their colors inspire you: the shocking fluorescent pink of a chard stem, the deep reds and purples of baby kale leaves, the bright shades of green that emerge in the spring, and even the calm yellows and whites of so many winter vegetables. Thinking about produce in terms of color can reinvigorate your relationship with food, and in this collection of recipes, Hasselbrink employs aesthetics, flavor, and texture to build gorgeous yet unfussy dishes for every season. Recipes take you on a journey through spring’s Pasta with Nettle Pesto and Blistered Snap Peas, summer’s Berry–Coconut Milk Ice Pops, fall’s Turkey Burgers with Balsamic Figs, and winter’s Sparkling Pomegranate Punch. Featuring photo pairings that celebrate not only the finished dishes but also the striking ingredients that create them—plus a photograph of each and every recipe—this book reveals an artistic picture of whole foods eating. KIMBERLEY HASSELBRINK is a food photographer, writer, and creator of the acclaimed site The Year in Food, which was a finalist in Saveur's 2012 Best Food Blog Awards and has been nominated again this year. Her work appears regularly in the Etsy blog, and her photography clients include Williams Sonoma, Bon Appetit, Harvard Common Press, Kinfolk magazine, Edible San Francisco, Foodzie, Rewinery, Grist, and CUESA. The Year in Food has been praised by The Kitchn, Food52, Gourmet Live, Anthology magazine, Refinery 29, Spry Living, and Babble. Bon Appetit named Kimberley's Instagram account one of the fifteen Best Accounts for Food Lovers. 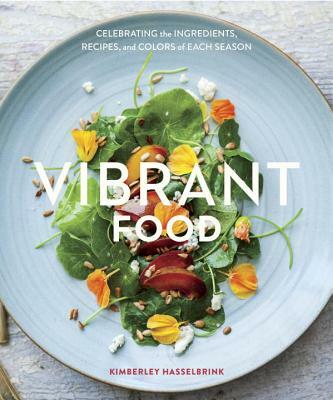 "The title says it all—this cookbook exudes vibrance. Its pages are filled with simple, healthful, and flavorful dishes I see myself cooking every day. These recipes, arranged by season, will make you run to your local farmers' market again and again." "I love the wonderful clarity and focus of this book: simple, vividly photographed dishes that highlight the unique flavors, colors, and textures of every season."